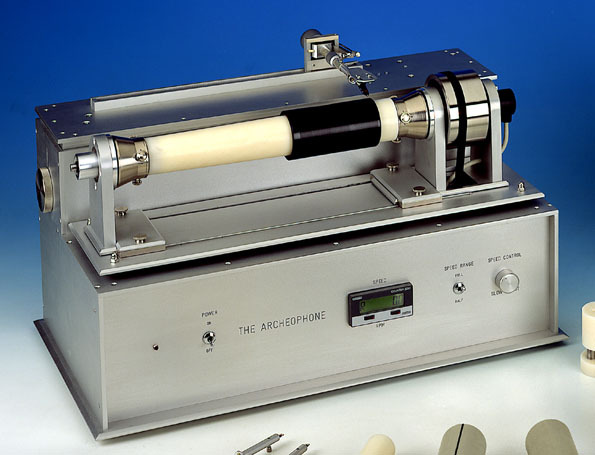 Short of laser readout, the Archeophone is truly a state-of-the-art phonograph. Around a heavy aluminium casing, Henri Chamoux has built a no-compromise 24 kilograms machine that has just about everything any cylinder collector could want, and is now producing the improved Series II Archeophone. It is driven by an asynchronous Revox motor with variable speed. The speed can be read in the window on the front of the player in the picture above. The lowest speed being 44 rpm, below half the speed of the slowest playing cylinders, it allows for tracking very misshapen cylinders for transcription. In addition to that, the mandrel axis can be offset in any direction by two screws, turned by hand, on each of the two spindles that hold the mandrel. This corrects the excentricity often found in cylinders that have gone through the hardships of real life. The motor drives the cylinders via a belt that turns a flywheel. The mandrels will take literally any size cylinder. For most sizes, they are 280 mm long, and so even a damaged cylinder will find its proper rest position. The main body of the mandrels is polypropylene, which damps out any resonance one might have found in metal mandrels. The mandrels can be inverted to play the cylinders backwards, in order to find the least worn parts of the groove. 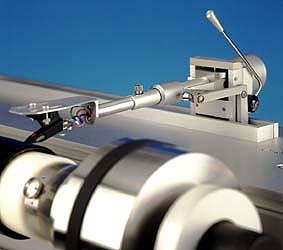 The tone arm is a radial Pierre Clément arm with interchangeable shells holding Shure cartridges. It will of course follow any spacing of the grooves all by itself. 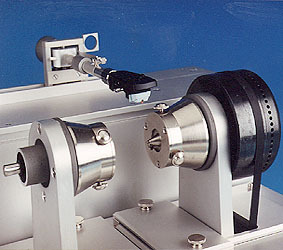 Adjustment to cylinders of different diameters is done by raising or lowering the whole tone arm assembly by loosening the large knurled knobs on both sides of the casing. The styli are made of corundum or glass and come in three sizes. The Series II Archeophone comes without preamplifier, as preferred by most users. Henri Chamoux makes phonograhps to order, including a set of four mandrels, plus six optional ones, to play almost any size cylinder. He also offers the use of the machine for transferring cylinders to other media. So far it has been used to transfer well over 1000 cylinders to DAT tape and, more recently, CD. At the centre of each spindle are the steel points that hold the mandrel in place. These can be offset to compensate for excentricity in the cylinders by turning the two screws on each spindle. 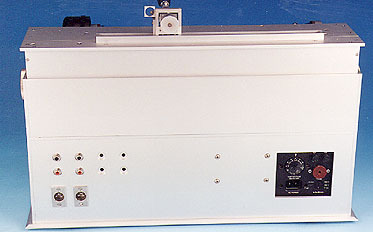 (Series I Archeophone) The tone arm on the Series II Archeophone has a simplified manual lift mechanism, and is now equipped with headshells with standard mount (not shown here).